Clever, Crafty, Cookin' Mama: Beware of Harks!! So we did a lot of family bonding road trips in my youth. I have ton of fun memories camping and going on day trip adventures around Washington. Of course, some road trips were more adventurous than others. Heck, even trips down the hill and through the valley to church could take on an other worldly spin if you had a good enough imagination. Luckily for us, my dad was a never ending spring of imagination, however warped. Whenever we would drive over a bridge, whether it was one that could open up to let boats through, or something very large like the Narrows Bridge in Tacoma, he would always pretend we were running out of gas and the bridge was opening. He would unevenly tap on the gas to give the illusion we would have to stop any second. As a child you would envision the bridge opening up fully and your van out of gas sliding off into the murky water below. But that wasn't even the really scary part of our trip to church. We lived on a hill and had to go through the valley to get where we were going. 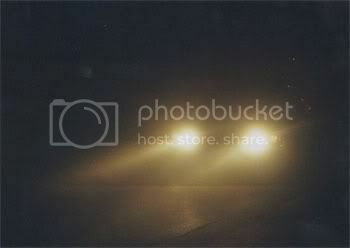 It was always foggy in the early mornings and many people would drive with only their fog lights on. Dad decided to tell us that those yellow lights were not merely cars, but glowing EYES that belonged to the legendary creature known as "THE HARK". Yes the terrible Hark that was half horse, half shark - or rather a very large shark head (with lots of teeth) on a horses' body. It could run faster than a train and traveled the valley looking for broken down cars (and especially children) to eat. Needless to say that our trips to church were never dull or boring - matter of fact I think it enhanced our spiritual life, as we spent most of the time praying our car wouldn't run out of gas on the bridge. Oh, the memories of hanging out with the Ford clan. You must blog about the April Fool's joke involving knives and catsup...My favorite! Gives a new meaning to the song "Hark the herald angels sing"...a decidedly dark and disturbing meaning, if you ask me. Which you didn't, of course. But I forgive you for the omission...after all, after the being chased by harks and terrorized on the toilet, you are probably suffering from post traumatic stress disorder and should be handled with some care. I hear that you can cure PTSD with baking soda, but that may just be a rumor. Oh my gosh...I can NOT stop laughing abouth the "Hark"!!! That is one of the funniest things I have ever heard. I mean really...can't you just picture it now Jen? I will never look at fog lights the same. You KNOW how afraid of sharks I am! Now they are following me on LAND...at the swift pace of a trusty steed...I'll never sleep again. Did I say laughing...I meant CRYING!